Matt Egel, Kaidon Brown and Clayton Pyne were jubilant winners of the Sprintcar, Speedcar and Late Model main events in the final round of the Hi-Tec Oils Ultimate Speedway Challenge tonight at Murray Machining & Sheds Speedway. 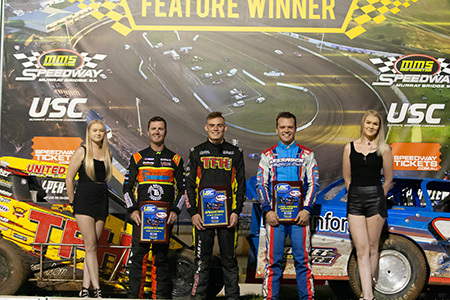 For Robbie Farr, the lure of a possible $100,000 bounty for winning main events in all three categories – the Sprintcars, Late Models and Speedcars – was mouthwatering. He did his best to pull off the previously unthinkable with two second places and a fourth after driving a total of 150-laps across the three categories. He narrowly missed out on three podium finishes with a fourth place result in the Late Model A-Main. Regardless of the results Farr's performance is believed to be the only one for a driver in Australia to drive those three classes on one night. For Matt Egel it was redemption for the big wreck that saw him flip out of the 60 for 60 for 60 A-Main the weekend before in the #97 Downing Brothers entry. Keller was fast and started on the front row with Egel with Marcus Dumesny and Robbie Farr starting on the second row. Ryan Jones had to come from the B-Main after diff problems even before hot laps saw him miss qualifying and hot laps. In the A-Main he smacked the main straight wall very hard and bent his rear axle but still remarkably stormed home to a top five result. 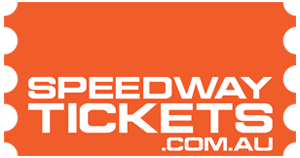 Kaidon Brown broke through for another satisfying career victory at MMSS with the round win in the Speedcar main event for the Ultimate Speedway Challenge to lead home Robbie Farr in second place and Victorian Travis Mills in third. Robbie Farr led early with a stout battle breaking out behind him between Travis Mills and Kaidon Brown for second place. Brown managed to escape Mills’ clutches and steal out after the leader before effecting a later race pass on Farr and driving away for his second career win at MMSS and back to back results in the Ultimate Speedway Challenge. “I felt good in the car and after I was able to get a break on Travis and go after Robbie I knew I had to just settle down and hit my marks. The was on point and we could get the win, I love racing here and of course winning makes it even better,” grinned the 18-year old after the race. Clayton Pyne and Callum Harper put on a battle royal out in front for much of the race with Sydney veteran Darryl Grimson and South Aussie young gun Ryan Alexander also buying into the argument. Pyne was able to blast the top and move away before Harper pulled back to within half a car length by the fall of the chequers.